Almost all electric troubleshooting gets a lot easier with a multimeter, right? A multimeter is a useful device used in electronic works which can read different electrical inputs and give the user output in digitals. It can be used to check for connectivity between wires, test resistor values, test battery volts, how much ampere there is and the current power. They do often have modes for alternate current testing as well as direct current testing for different applications. It is commonly used by electrical engineers and by those who have a keen interest in electronics and people who like to do projects. In short, a multimeter serves the purpose of reading the power value of different electrical components. A multimeter, as the name suggests, performs 3 main functions. It works as a voltmeter, ohmmeter, and amp meter, but can, of course, have a lot more functions depending on the model. If you are looking for a good quality multimeter to use, you have come to the right place as we have gathered the best digital multimeters you can buy. In this article, you will find the best multimeters for all your needs. If you want to learn more about multimeters before buying one, check our buyer’s guide and information in the bottom of the article. Fluke is one of the best brands out there in the market. 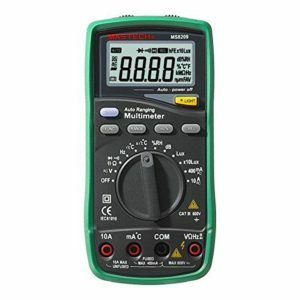 It produces high-quality multimeters with lots of safety features so that you can all in one package for a good price. The design of the fluke 115 is compact and its ergonomic design makes it easy to hold and grip. It will take readings of every and anything with the right option selected. Its sturdy design and solid creation make it a good device to have and in terms of operation, it can read max 600v whether ac or dc. If you are looking for a multimeter with more functions, you should check out the 117 in the second place, why we placed this in the first place is because of the great bang for the buck. Coming to safety, it has a score of CAT III 600 v. This makes it a great device in such a price range including the features and design. So if it fulfils your requirements, this is a good and long lasting device to have. This is absolutely a multimeter made for the professionals, but the price makes it available for home-usage without breaking the bank. It is built to be tough and rugged with a compact design to withstand drops and shocks without breaking. An upgraded version of the Fluke 115, the 117 true RMS digital multimeter is one effective device and easy to use. It has a compact and rigid design which makes it a good device to have. It can be used for many different electronics applications. 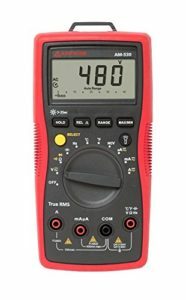 This multimeter features a large digital display and shows you accurate results when the probes are connected. It is rated CAT III 600 volts in terms of safety. This device comes with a lifetime warranty, which may tell us the great performance and quality of this multimeter. These factors make it a must-have device if you have the capacity to spend a little more than the 115. Absolutely a multimeter made for professionals and for you that are only looking for the best. The balance between an easy usage and the ability to measure advanced troubleshooting is what makes this multimeter so great. You do not need 1000 different functions on a multimeter to make it good, from what Fluke shows us! This device is NIST certified which makes it a good meter to be used as per manufacturers specs. It features a bright white LED display with backlight that’s visible in bright light as well as in the dark. Another one of the great devices out there is the Amprobe AM-530, this one is also a true RMS meter aimed at professional users and electricians. It features many different functions for different users and can test the continuity of electrical paths as well as test fuses and check motors. Absolutely a competitor to the fluke multimeters mentioned before. 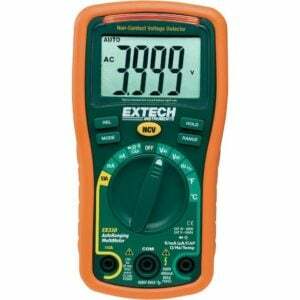 This multimeter is really priced well and is really affordable. The decision between the fluke and this one can be pretty tough, but we liked the fluke multimeters more due to the functionally and the interface. Includes the necessary accessories like a strap & a carrying case. 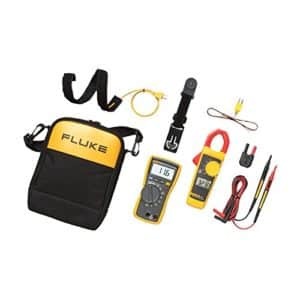 Another one of the flukes are the Fluke 87-V is one powerful meter you’d want to have as it’s accurate and often used in the industry and by many professionals and even electricians. With a rigid and solid design, it makes it a good design to be carried around. This meter is without a doubt very accurate at calculating the current and volts and will also give you the frequency readings on drive motors and other electrical equipment. It can also measure a max of 1000 AC and DC volts. Not only this but with its built-in thermometer, it can even take temperature readings to determine if the equipment being testing is producing unnecessary heat. This makes the job easier and you won’t need to keep a thermometer separately in order to take temperature readings. This makes this device different than its counterparts and makes a good choice. Can take a reading of max 1000 AC and DC voltages. This is a multimeter for the one who is looking for a really strong and durable multimeter for professional use. The price might be a bit high for the ones who are looking for a multimeter to do easy tasks at home with. But, if you can afford it and want the best – This one should be your choice. Has a solid build and rigid layout to withstand drops and shocks. Besides that, this device can measure a max of 600 volts in DC and AC both with a 0.5 accuracy in calculating the results. It can also measure up to 10 amps. It has a safety power off when not used for a long period and a tie to hang it on your belt or pocket. The EX330 is easy to use a unit with a user-friendly interface and design so that even those new to meters can learn to make use of these quickly. Overall, the EEX330 is a good device which gives accurate results and has a solid design. What we found disappointing about this product is that it feels a bit cheap when you hold it in your hand and we thought the quality would be a bit higher. However, the price is cheap and you can’t expect too much from cheaper multimeters. 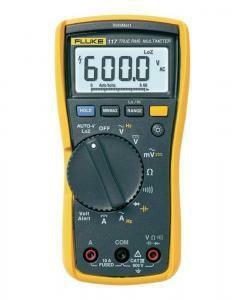 We do still recommend to check the fluke multimeters in this price range instead. The Mastech is one of the big names in the market due to their high-quality products. Their devices are well constructed to serve the purpose and do it accurately. As the same as the device says, it’s a 5 in 1 multimeter device which can be used in homes as well as in the industry. It can be used for many electrical applications. This is a multimeter for the one who is looking for a lot of functions included in one multimeter for a decent price. However, from the price, we could also say that if this was a high-quality multimeter, it would cost hundreds of dollars more. So, the quality of this multimeter is not the best, but you get a lot of functions for the price. Suited for home use as it combines the basic features of a basic meter, temperature gauge, humidity gauge and digital meter. If somehow you aren’t still convinced by the meters mentioned above, maybe this one might. 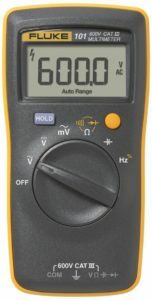 The fluke 101 is a basic meter for simple use at home or in small electronic projects. But it’s just as versatile as the other products. And with a low price, this meter might catch your attention. 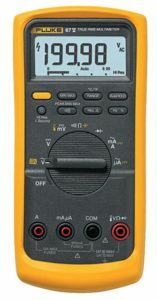 Since the Fluke 101 is a low price meter for basic use, it’s preferred by many DIY people and those interested in electronics. With its compact and lightweight design, it’s easy to use and carry around. It has an LCD screen, features auto shutdown and a beeper for continuity. Overall, it’s a good meter for basic and home use and at a low price, that makes it even better. If you are looking for a multimeter with a lot of functions, this one is not for you. This device is made tough and durable to withstand device drops and shocks so that it doesn’t break so easily. A very lightweight device and small which can be carried anywhere. Has a large LCD display which makes reading the results easy. A simple and easy to use clamp-meter, the Etekcity is aimed at newbies and those without technical electrical knowledge. The large screen that features makes it easy to view under bright light as well as dark situations. It offers continuity check, diode checks and much more. Included with the device is a pouch to keep the meter in, making it easy to carry around and keep it keep scratching or getting damaged. It is also backed up by a 1-year warranty. The device will shut itself down if left inactive for 15 minutes to save power. Keeping in mind all these features, this makes it a good enough device to be used in homes. A great device for the one who is looking for a multimeter and a clamp-meter in one. The quality of the meter could be a bit better and we found disappointing that the screen didn’t was lightened up by a light. Another bad thing is that this multimeter can’t read DC voltage. 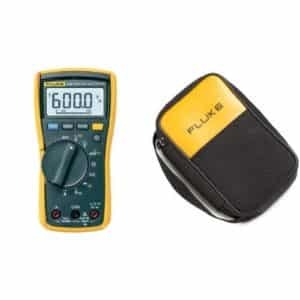 If you happen to be looking for a nice HVAC multimeter and a clamp-meter in one package, then look no further as again, Fluke has you covered. The Fluke has in store for you its 116/323 HVAC meter which makes it a respectable meter in the market. It build quality is just as strong as its other devices so that it can handle tough situations effectively. This meter can be used to check temperature, and also microamps. It also features a big display for best visibility in the dark as well as under bright light and features a shoulder strap to keep it with you. Overall, it’s a really good device to get if you require an HVAC meter. The Fluke is back. With a different model. The fluke 323 is in the family and claimed to be the perfect and true RMS meter with clamps. It is suited for all kinds of people. From hobbyist to professionals, industrialists to electricians, this device will work best for each situation it’s given. With its ergonomic design, the device becomes easy to carry and use. The Fluke 323 features a beeper for continuity, and rated CAT IV 300V/ CAT III 600V for the safety chart. If you want to address the minor electrical problem at home or at work, you can take this device with you and get your work done with a problem. It has a big enough display to check the results and one easy to use the meter if you are new to it. A high-quality clamp meter for the one who are looking for quality together with the most useful functions. How do I use a multimeter? Multimeters are used to check the continuity, voltage or resistance of a digital circuit or component. Using one within reason easy. All you have to do is connect the multimeter to the circuit with the help of placing the black and right probe into the right terminal. 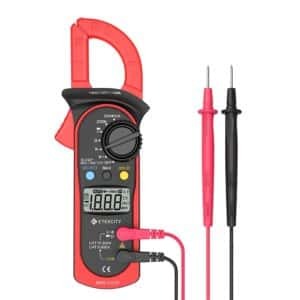 If you want to test and use the resistance calculating feature of the multimeter, all you need to do is just twist the selector knob to resistance and simply connect your probes to the appropriate points of the resistor and there you have it. Digital multimeters are generic and can be used to test a wide number of things like resistance, voltage, DC and AC check, and much more. Since all these functions have their own selection, it can be extremely dangerous to use the wrong option for the wrong test as it can damage the device or even cause an explosion. Why should I use a multi-meter? Multimeters are usually used to measure voltages and current but now these devices provide functionally to test diodes and continuity as well. Resistance can also be measured. This is helpful when testing a new wiring layout or testing an electrical component. Batteries can also be easily testing using them. Multimeters are usually used by Electrical Engineers, Technicians, DIY lovers, Electronics hobbyists, and engineering college students. There are various types and designs of multi-meters in the marketplace. It is critical to pick out the right one in order to fulfil your requirements. So, which multi-meter is right for the cash? It really depends on your budget and level of usage. A multi-meter tool can assist someone who works on his car, or maybe an HVAC device at home. A multi-meter device that is good for a professional electrician may not be suitable for a newbie. This is because there are tools which might be too technical and features understood by electricians or professional. Before choosing a multimeter, there are some things to look for which can help you select the right one for yourself. Here is a list of the most important things to check for before you are purchasing a multimeter. Since the first-rate multi-meters are rated at different CAT levels. if you are looking for a safe and comfortable meter, look for one that is CAT rated as they are made with safety features as a priority. Furthermore, the voltage range should be appropriate for the meter which you’ve selected. Other protection features to look out for consist of overload protection, reverse polarity, safety cut off in case of the wrong model selected. The most important part to check for before purchasing a multimeter, is the functions that you need. There are a lot of different multimeters on the market with hundreds of different functions. Which functions do you need? Do you need to measure only DC or also AC voltage? Do you need an included thermometer? Check the most important functions and find a multimeter with the functions that you need. Sometimes it can also be better to have less functions because it makes the multimeter much easier to use. There are multi-meters of all sizes and designs. When selecting a meter to suit your type of work, it is essential to select one this is of the proper size to make your job easier. Some meters are big in size whereas others are small. Ensure you choose one that is compact and is easy to handle. If your work involves a variety of fieldwork, a compact, and strong-made design is the most desirable tool to have. Warranty is as important as the price. A product backed up by warranty gives a sense of responsibility the brand holds. At times, meters come damaged out of the box or don’t function properly. So, in that case, the warranty becomes important. Another crucial function to examine is the accuracy of a multi-meter. Not all multi-meter tools provide high accuracy. So, before you choose one, you should make sure that it gives accurate results. The stage of accuracy may additionally rely upon the sort of circuits that you may be working on. Even although there are plenty of brands that offer multi-meters available on the market, getting one from a notable brand may be a good choice. Choose from a brand that has a good name in the market. A number of well-known and quality brands are Amprobe, Klein tool electrician, Craftsman, Fluke, Innova etc. This is a critical aspect of a multimeter. This is for people who work in industrial areas. The meter can fall from the bag or maybe fall off at some stage during its operation. For this purpose, choosing a rugged layout that may face up to all of the hardships is very important. Some meters are terrible at this and will break after falling. For having a long-lasting device, you should pick the most well-constructed, rigid and accurate multi-meter which can endure all the heavy usage and with the help of the safety features, wouldn’t become a paperweight in case of a human mistake in operation. When deciding on a multi-meter, you shouldn’t only look at the price. The first aspect to have a look at is whether the meter is good enough for you or not. Easy and basic ones are offered at a small price whilst in comparison to the more costly and advanced meters. Pick a meter that is affordable but has the features that you need. You can get multimeters with various alternatives and different functions. Some provide capacitance size testing, some allow you to check for different diodes. You can even find meters that, besides their ordinary functions, give out temperature readings. Some have oscilloscopes that can help you save readings through the years of its usage. This may be pretty useful in case you want to test out fluctuations that took place some time ago you can get this feature for each analogue and for digital readers. Some range in just how large their displays are, different have different display fees.